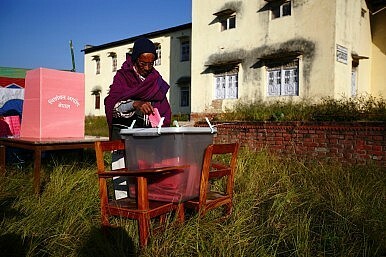 A Nepalese man casts his vote on November 19. Nepal’s Constituent Assembly elections achieved a modicum of success. Can stability and a constitution follow? Developments in Nepal’s second post-war attempt at institutionalizing democracy are moving rapidly. Despite the predictable skepticism of doomsayers, on November 19 some 12.21 million voters, of 102 caste and ethnic groups, speaking 92 languages, across 240 constituencies elected a Constituent Assembly (CA) tasked to draft a constitution within a year of its tenure. Though the last CA’s attempt to do so was a spectacular failure – and elections were by no means without defect this time around – the perceived legitimacy of Tuesday’s ballot will define Nepal’s political trajectory and its prospects of constitutional rule. Whilst formal statements are yet to be made by the European Union Election Observation Mission, the Carter Center, and Asia Network for Free Elections, it is expected that similar sentiments will be expressed in the coming days. Though the High Level Political Committee failed to convince Mohan Baidya’s breakaway CPN-M and its coalition of 33 poll-opposing parties to participate, commentators have been quick to downplay the relevance of those abstaining, citing mass defections in the run up to elections as proof of the CPN-M’s increasing isolation. Since the announcement of CA elections in May, analysts have been circumspect. A product of Khil Raj Regmi’s technocratic Chief Justice-led government (which itself fragmented pro-democracy forces through the merging of executive and judicial powers), the relative success of the November 19 elections is – even if ungratifying in the long-term – a logistical coup. Were they delayed even by weeks, Nepal’s constitutional limbo would likely have been extended until April 2014 due to the inaccessibility of remote mountain districts from December through March. August’s Tribhuvan International Airport runway farce – in which election-related materials were grounded in Delhi due to the ailing condition of the country’s only international runway – was almost definitive. Last-minute delivery of voter ID cards created difficulties too, with registered voters using citizenship certificates and other official documents in establishing their identity. Though reports of incomplete voter rolls and incorrect voter ID cards have been made, it is unclear how pervasive this was. The conviction of Chief Election Commissioner Neel Kantha Uprety that “the CA polls must be held on the slated date of November 19” makes clear the urgency with which elections were carried out. That they were a procedural success is indeed remarkable. Still, issues unhappily familiar to Nepali politics provide a note of caution. Disruptions led by CPN-M from November 11 – though ultimately unsuccessful – contributed to perceptions of instability and voter intimidation. The November 16 torching of a commuter bus in Kathmandu resulted in the driver’s death and severe injury to eight passengers whilst the ongoing transport strike affected the travel plans of those required to vote in outlying constituencies. Likewise, the willingness of campaigners to violate EC directives did little to reinforce a rule of law already tenuous. According to a November 13 report by the Informal Sector Service Centre (INSEC), 521 incidents of poll code violations occurred from October 18. Whilst 136 of these infractions were committed by the poll-opposing CPN-M, all political forces – including high ranking officials – have been implicated. Despite initial EC reports of an unprecedented voter turnout of over 70 percent, questions over the expanse of the democratic franchise hold some legitimacy. Of approximately 16 million residents of voting age, a turnout of 12.21 million was achieved, with estimates of 30 percent of registered voters failing to cast their ballot. Another 3.5 million – over 20 percent of the voting age population – were excluded altogether. Approximately 2.9 million migrant workers were unable to cast a vote.